I’ve been trying to get to the centre of things this week. Now that I have had such a good time making molded chocolate hearts, I am itching to fill them with fantastic flavours. Feeling very French, I launch myself into the Ecole Chocolate reading and technique for ganache. I am delighted to find one explanation for the derivation of this word is, in slang French: Idiot! This term was supposedly coined when a hapless kitchen apprentice dropped hot cream into a bowl of chocolate. I am very thankful to my forerunner, as he managed, however unintentionally, to create one of my absolute favourite things to eat, whether as mousse au chocolat, sandwiched between cake layers, or rolled in cocoa as a truffle. The smooth and luxurious texture of ganache is to me, comfort food at its finest. I thought, from my previous baking experience, that I actually knew how to make it. And perhaps I have had success with chocolate mousse (which never lasts more than a day in our house – and it’s not the boys who sneak to the refrigerator in the night), but I have never attempted ganache that will keep, stay emulsified, and have the properties to be used for filling chocolates. I indulge myself with a cup of tea, and settle down to watch the engaging Pastry Chef and Director of the Valrhona Ecole du Grand Chocolat, Frederic Bau, and his (I have to say it) annoying little animated cocoa bean sidekick. I find myself responding “Oui, oui bien sur!” to the screen, as Chef Fred patiently but passionately explains the method for adding hot cream to the chocolate, little by little, to produce an emulsion. The cocoa bean wants to add the cream, in one go. I, the viewer, know this will be a disaster – and it is – as shown by the terribly unattractive, failed ganaches Chef Fred shows us later on in the video, after the ganache has been left to crystallize – the process which “gives the emulsion time to develop interlocking crystals that promotes smooth mouthfeel and keeps all the ingredients in suspension at room temperature for longer shelf life”. Then, he shows us the perfect ganache he has produced, adding the cream in five additions, with much careful mixing – beaucoup de friction. It was magic: flexible, creameux, pas grasse! I want nothing, so much as to make Chef Fred’s perfect ganache, right now. I run downstairs to the kitchen, break up and weigh out ½ a pound of chocolate, gaily throwing in some of this kind, and some of that (I think I put four different kinds of bittersweet in the bowl), stick it in the microwave oven to melt it 70% (having no idea what this would look like, I guessed – I figured it meant mostly melted), pour the heavy cream into a saucepan, and bring it, gently, just to a boil, then start adding it to the warmed chocolate, in small additions. I know Chef Fred would be nodding his head in approval. I even whisper “juste un soupcon” each time I add more cream (for a total of 5 additions). I use beaucoup de friction to break up the molecules, and to get the suspension of the cocoa butter (the fat) and the liquid (the water in the cream – un emulsion). It looks just like it is supposed to – a thick glossy brown mayonnaise. I am delighted, as I slab my creation, pouring it out onto a Silpat-covered marble slab; the very cool professional candy-maker’s frame (like a big plastic picture frame) holding the contents in a rectangle, for easy cutting, later on when it is set. I am surprised at how easy the ganache is to move around – really flexible, not sticky. After a quick consultation with my partner, we decide the best place for this ganache to crystallize (as it needs a cool place), is the marble topped fireplace in our bedroom, which is surrounded by big windows, but very shaded at this time of year, by huge Douglas Fir trees. We move a LOT of stuff off the fireplace (we are very messy people), and carefully place the ganache atop the cool marble. It looks so pretty – glossy dark brown against dark green. We solemnly vow that no stray sock or piece of electronic equipment will be absent-mindedly placed in the middle of the crystallizing ganache. Nothing to be done now, but to leave it for 24 hours – then cut and enrobe in chocolate. Buoyed up by my assured success, I decide to work on another filling – pates de fruits. These jewel-like candies were my Dad’s absolute favourite, and are nothing like gummy bears or jelly babies – they are like a burst of concentrated fruit in your mouth. 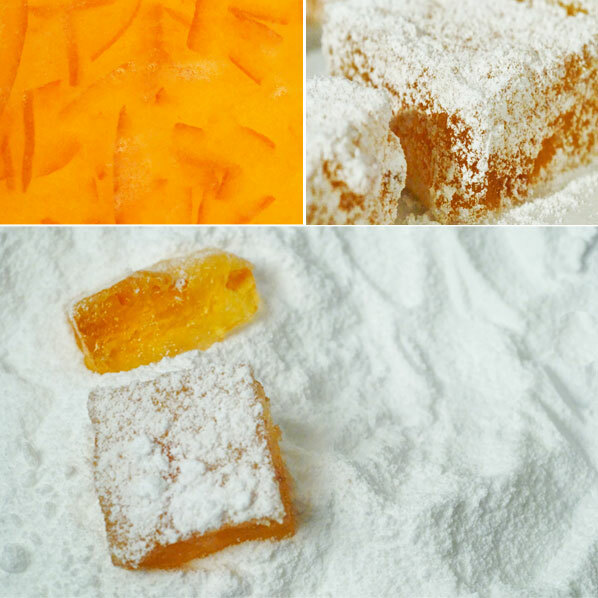 Little fruit squares, dusted in sugar, I’ve always wondered if I could make them. And now, I am going to try. I get everything set up, then dash out the door for parent-teacher interviews. When I return, a couple of hours later, my son is very curious about the next thing to be concocted in the kitchen, and when he discovers that I will be making Grandpa’s favourite, he is keen to help. He has fond memories of his Nana and him “sneaking” Grandpa’s special jellies, so I start reading out the instructions, and he takes over the cooking. I am more than a little proud as I watch him stirring and sniffing, measuring and explaining to me that sugar and water cooked together are known as a simple syrup. In surprisingly little time, we have a pan of brilliant orange stuff, sitting in the refrigerator, and once again, we wait. The jellies need only four hours to set. In the interim, I look up pates de fruit recipes on the internet and discover that there are a whole lotta people as passionately devoted to them as chocoholics are, to the gorgeous brown stuff. And, being lucky enough to have a garden and a freezer, we have enough organic local fruit, frozen in season, to try out many pates de fruit combinations. I foresee a beautiful partnership. Dinner and homework finished, and four hours time up, we pull the pan from the ‘fridge, cut the pates with a wet knife, and free them from the pan, one by one, with a small off-set spatula. They are then carefully picked up with the special chocolate enrobing forks – I love a multi-purpose tool – and put in the bowl of sugar. I have used super-fine this time, but I think I’ll go for a coarser, more rugged look next time. And that is that. The pates de fruit look fantastic, and now I am off to the bedroom to sneak a look at the ganache – and it is a disaster! As the boys would say: “Epic Fail”. The cocoa butter rose to the top in patches, after a few hours on the slab. Unattractive white streaks blot the surface of the chocolate. Tres grasse, tres mauvaise! Oh, Chef Fred would be so disappointed. I want to weep. Perhaps I did not melt the chocolate sufficiently, or perhaps the cream was cooling too fast, or I did not use enough friction in mixing, to evenly distribute the fat molecules. I go back to the notes, watch Chef Fred’s excellent technique, and resolve to make it again the next day. And I follow his recipe and technique exactemente. Yesterday, I confess, I did not follow the Valrhona recipe, as posted, in the technique section, but used the simpler one which followed … and then, yes another confession, used Chef Fred’s technique with the other recipe. So, perhaps using the wrong technique, with the wrong recipe, may be what caused my Epic Fail, although, I thought I understood the principal. In any case, there is a happy ending to this tale. The second ganache crystallizes beautifully: smooth, velvety, flexible, delicious – pas grasse! We conducted taste tests with both ganaches and I am happy to report, that my sons and partner, clearly noted the difference in mouthfeel, taste (the first ganache, they noted, had a harsh aftertaste), and smooth texture. We are all developing discerning palates. That is, if you can call squishing a pate des fruits together with a piece of ganache, and popping the whole thing into your mouth in one go. Mmmm, merveilleux!